If you've been waiting to try out your best rendition of Kramer's "these pretzels are making me thirsty," your day has arrived. 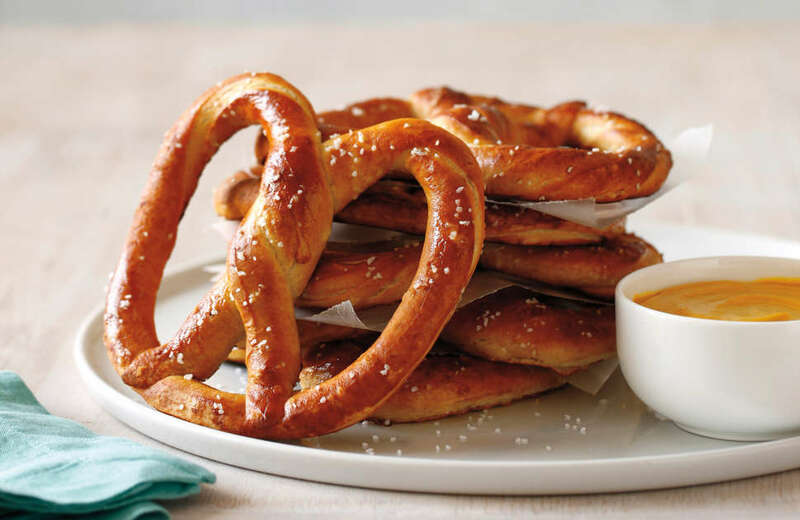 Thursday, April 26 is National Pretzel Day, which means you can spend the day tracking down delicious, free knots of dough. It's a good day to determine the official, unassailable answer to how a soft pretzel is best enjoyed. Nacho cheese? Cream cheese? (That's the correct answer.) Yellow mustard? A bit of salt and no dip? It's your choice, and there are a whole bunch of places offering up a free pretzels and other deals to help you decide. The deal: For the 11th consecutive year, the pretzel shop with 170 locations is giving everyone a free pretzel all day long. Some shops are even handing out cards that earn you another free pretzel on another day. It's pretzel mania. The deal: This is just about as easy as the Philly Pretzel deal. Show a cashier you're following Pretzelmaker on Facebook or Instagram, and they'll hand you a free pretzel. The deal: Designers like Mike Perry (known for his work on the credits of Broad City) have contributed to a limited edition line of clothes to benefit Alex's Lemonade Stand Foundation. But that's not free pretzels. 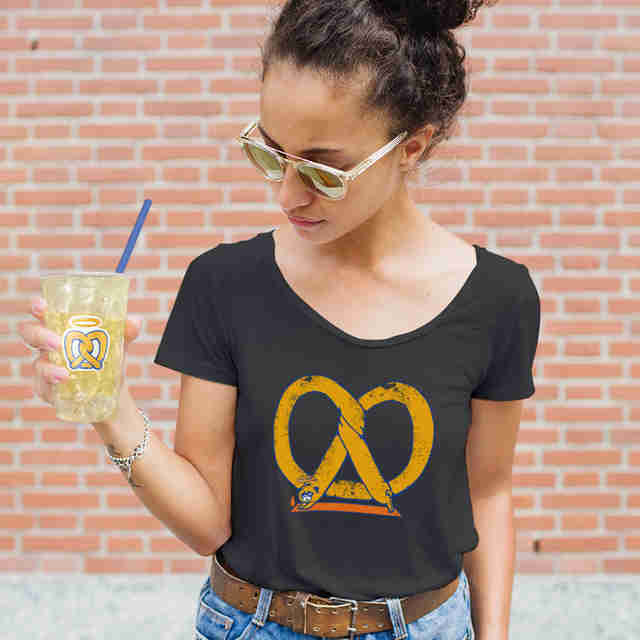 Head to an actual Auntie Anne's and get a free Classic Pretzel with the purchase of any other pretzel when you download the shop's app. The deal: A pretzel and beer is a classic combination. Grab a liter of Hofbrau Bier and Bierhause will give you a free small pretzel from the Bavarian pretzel-maker Prop & Peller. The deal: Get to a Ben's for a nearly free pretzel in honor of the food holiday. All locations (except stadium locations) will hand you a soft pretzel if you make a $1 donation to the Intrepid Fallen Heroes Fund. The deal: Pick up a pretzel at the convenience store, and you'll get a free Chill Zone beverage. The deal: Get a free chocolate-covered pretzel cannister with any purchase from Godiva.com all the live-long Pretzel Day. The deal: Your neighborhood grill is offering $1 margaritas every day through Cinco de Mayo. It's not a pretzel, but if they're making you thirsty, this might help. The deal: Download the Wendy's app and you'll find a deal for buy-one-get-one-free Dave's Single burgers. There is a coupon for a reduced-price salad as well. The deal: Download the donut shop's app and you'll earn yourself a free donut for signing up. The deal: It's an exercise in delay gratification, but you can lay the foundation for a future free ice cream cone today. Sign up for the Baskin-Robbins newsletter by April 30, and you'll be emailed a coupon on May 1 for a buy-one-get-one-free ice cream cone or dish. The coupon is good between May 1 and May 5. More Free Pretzel Day Deals? If you know of National Pretzel Day freebies and deals we missed, email us at news@thrillist.com and we'll add 'em here.